The Coptic (Christian) area of Cairo has been peppered with violence over the last several years as locals continue to play out religious conflicts in the streets and churches. Our guide was surprised we wanted to visit, but we couldn’t pass up the opportunity. Coptic Cairo is generally closed to vehicle traffic and police are stationed throughout. But once you get passed that, the buildings themselves are very much like churches and synagogues in other areas of the world. The Hanging Church (above), officially known as Saint Virgin Mary’s Coptic Orthodox Church, is built on top of a Roman fortress (that’s why it’s “hanging”). It’s much smaller than people who have toured European cathedrals would expect, but it is very distinctive because of its Greek Orthodox carvings and mosaic work. 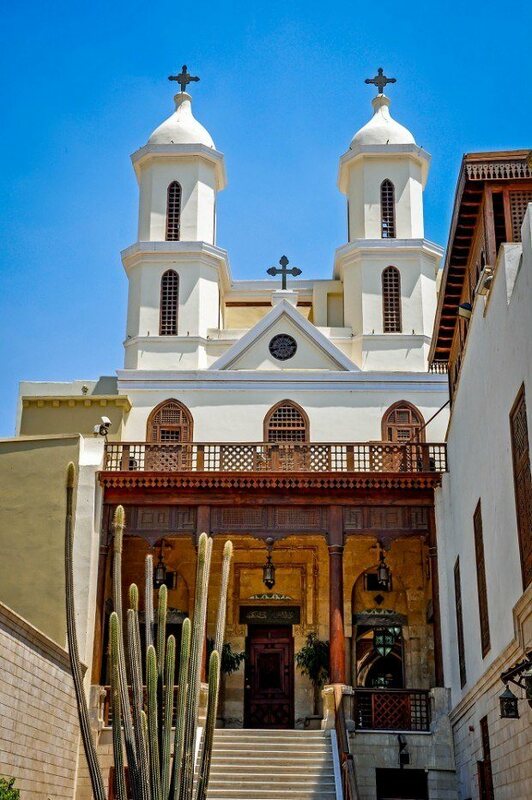 We also went to St. Sergius and Bacchus Church, an historic building in Coptic Cairo. It dates back to the 4th century, and tradition says that it was built on the site where Joseph, Mary and the infant Jesus slept after coming to Egypt because of persecution from King Herod. The interior decorations are similar in style to those in the Hanging Church. 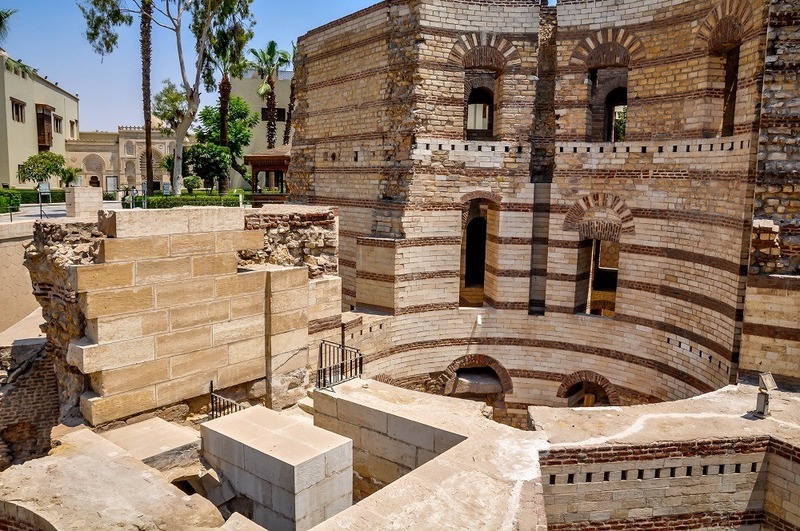 One of only a handful of open synagogues in Egypt, Ben Ezra is supposedly built on the site where baby Moses was found in the basket. Its story is beautiful but sad. After the Arab-Israeli conflict erupted in the 1950s, the Jews of Egypt had to leave. Some say they left voluntarily, and others perceive they were forced out. 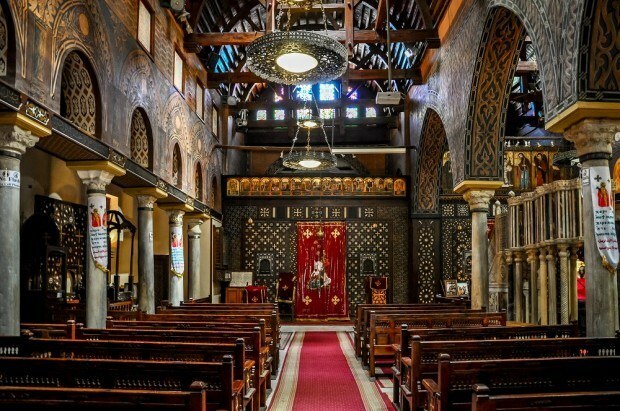 There were once nearly 100,000 Jews in Egypt, but now the number is estimated near 100. After several hours of visiting the churches and synagogue, we headed for a amazing lunch a Naguib Mahfouz Café. The restaurant is a lovely air conditioned spot named after Egypt’s most famous novelist. We had great pita with hummus and various spreads as well as falafel sandwiches and lemonade-like drinks that are a specialty in Egypt. The prices were a bit higher than other places nearby, but the ambiance, good service, and convenience were worth it. In the afternoon, we had the opportunity to visit the huge mosque of Al-Azhar in Islamic Cairo (part of the Historic Cairo UNESCO World Heritage Site). Rather than being beautiful, this mosque was functional. 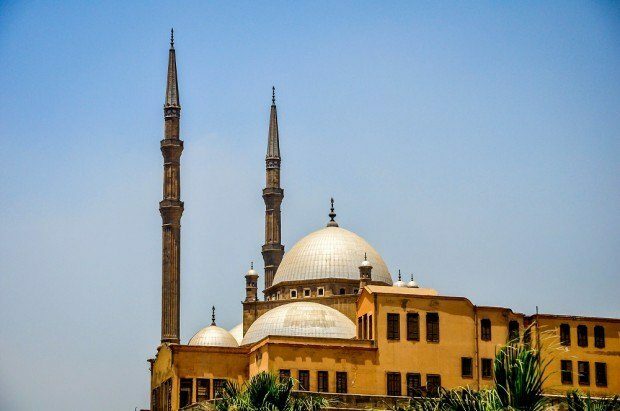 It was the first mosque in Cairo and strives to educate local Egyptians as well as Muslims from Indonesia, China, and other places in the world who come here for intensive study of the Quaran. After the women donned the coverups that the mosque has available for visitors, we walked around the courtyard and were able to go into the prayer area briefly. From the mosque, we went on to Khan al-Khalili, a massive market that seems to go on forever (and one of the 1,000 Places to See Before You Die). There are enormous areas for cloth, jewelry, local merchandise, souvenirs and other types of goods. As with many of the markets we visited, the vendors were desperate and bordering on aggressive. The months without tourists have left many of them broke and willing to go to great lengths to make a sale. Often, this included relentless yelling and following us through the market. As bad as we felt for them, the approach certainly didn’t make us want to buy anything. Nevertheless, we did purchase several t-shirts commemorating the Revolution (one of our favorites says, “The power of the people is greater than the people in power”), and Laura got a great deal on a lamp she liked. While we shopped, our guide waited for us at the famous café El Fishawy. She would not go through markets with us because she said the male vendors would scream horrible things at her if she didn’t persuade us to go in every shop. When we joined her, she had arranged for a local Nubian woman to give the women henna designs. 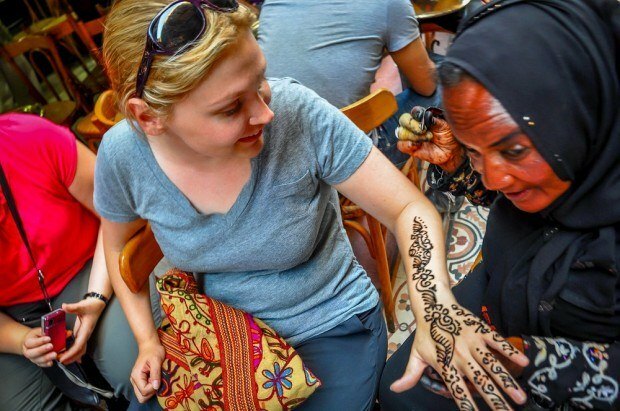 A henna tattoo that might normally have cost $10 in better times was only about $3 (and it lasted forever). 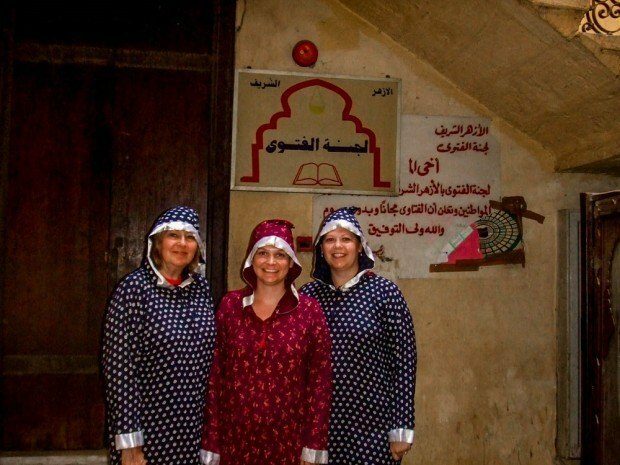 In the evening, we went to Abou El Sid in the Zamelek neighborhood. It is an upscale restaurant that puts a spin on more traditional Egyptian food. The atmosphere was a bit funky and classy at the same time, with décor focusing on aspects of Egypt’s history, and dinner there was the absolute perfect way to end the tour part of our trip. 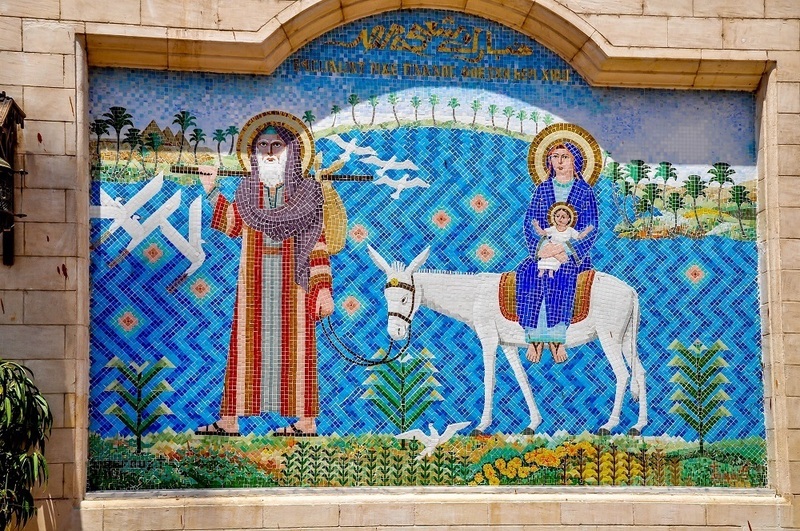 What do you think about Coptic Cairo and Islamic Cairo, Egypt? Good point. We meant to say Greek-inspired. I’ve made that change. Thanks for pointing it out.